Quntum is well known organization housing group of professionals, each having several years of experience in the field of analytical, scientific and process instrumentation. The company is founded by Mr. DM Musale and Mrs. Vaishali Dake – Musale along with their team in the beginning of 1992 for sales and servicing of analytical instruments mainly X –Ray radiation based products. These X-ray fluorescence (XRF) instruments are used for elemental analysis, thickness measurements on-line inspection, and laboratory and Quality control applications. With the relevant technical background since many years and excellent contacts with the customers, Indian market has supported the Company very well. In late 1994, the firm expanded under specialized management and sales/service network spread across India as well as nearby countries. The company joined hands with several foreign principals for promoting and supporting their hi-tech, sophisticated products exclusively in India and nearby countries. Our teams have attended several sales/ Service training courses, trade shows, seminars conducted by various foreign principals at their manufacturing facilities to support their products promptly and efficiently. By mid of 1997 we became a group company with wide horizon of activities involving promotion and export of sophisticated instruments, manufacturing and designing of test and measuring instruments, assembling of XRF analyzers under foreign collaboration etc. The company has a large office and work premise within the vicinity of Mumbai, well equipped with demo and application lab, service station, training facilities with all modern amenities. The company’s regional offices are spread across India together with result oriented distributor network within nearby Asian and Gulf countries. 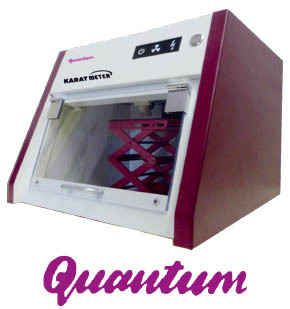 The Company’s key Product is KARATMETER Gold Alloy Analyzer based on X-ray fluorescence technique and other XRF products for elemental, bulk and thickness measurements. Besides these products company also deals in lasers for engraving, marking, cutting and welding as well as wide range of Easymelt induction heating for precious alloys melting/casting and industrial applications. Quantum is willing to enhance export market and looking for right partners and opportunities to start new ventures, The Company has adequate infra-structure to start assembly, trading and exporting various sophisticated instrumentation in nearby countries depending upon business possibilities especially in analytical and medical fields. We are pleased to introduce the latest in XRF technology Model, Karatmeter JL bench-top XRF Gold alloy analyzer optimized for all metals. This unit is based on high end SiPIN diode semi-conductor detector technology with state-ofthe- art electronics and best suite of flexible software. The above unique features are developed based on several years of experience in X-ray technology and considering future requirements and confirm that no manufacturer would be able to provide such features in low cost XRF unit, especially with PIN diode detector technology. Besides XRF we introduced latest in induction melting EasyMelt with patented air-cooled technology for homogenous melting ofprecious alloys. The small foot-print, fast melting, no pollution, nil maintenance, less energy consumption without any losses are the key features of this unique product together with affordable prices. We do have several induction applications for heating, melting, casting, hardening etc. for precious alloys as well as for industrial applications.